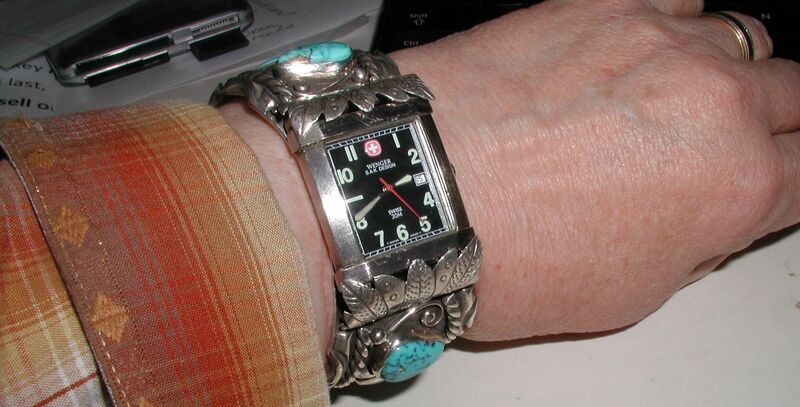 We receive many queries from customers and readers who have a Native American jewelry item that they want repaired. There is a difference between repair and restoration. If a bracelet has a break in one of the sterling silver wire bands and you want that break fixed so you can wear the bracelet, that is an example of a repair. If you have inherited a vintage squash blossom necklace which has lost two stones and has several crushed blossoms, and you want it to be fixed so that it looks like it did originally, that would be an example of a restoration. Repairing an adjustable chip inlay ring, that only cost $10 originally, could be cost prohibitive – unless the ring is so dear to you that cost is not an issue. However, with a vintage belt buckle that your grandfather wore every day and passed along to your father and now he to you – that might be a different story. The restoration might be costly but could result in an irreplaceable heirloom. Any repairs to Native American jewelry should be done by craftsmen experienced specifically in Native American jewelry techniques and who have access to materials commonly use in Native American jewelry. I have a split band Sterling Silver Tufacast cuff with one turquoise stone set in a bezel that is soldered to all 4 bands. There is a fine crack almost all the way through one of the bands due to opening and closing the bracelet (which I no longer do). Should I have it repaired or leave as is? Will the stone need to be removed? What if I just melt silver solder over the crack as a patch to camouflage it? First some definitions so all readers are on the same page here. A split band bracelet can have 2 bands or as many as, well 20 or more. Lenora’s bracelet is a cast bracelet with 4 bands.There are also split band bracelets that are not cast. Split band bracelets might also be referred to as a 4 Wire bracelet or sometimes a Spread Wire bracelet and yet that would not be correct as there are differences. A split band is a bracelet made of one strip of sterling silver whose mid section has been sliced lengthwise into the desired number of bands so that the bands are open in the center (such as the plain sterling silver cast bracelet below) or can reach out and attach to the centerpiece, usually a nice turquoise stone. A wire bracelet is similar in end result but is made by joining the desired number of sterling silver wires together at their ends to form the end pieces of the cuff bracelet. Tufa Cast and Sand Cast are basically the same procedure and you can read about the Sand Cast process in a previous post. Lenora doesn’t say where the crack is exactly but most likely it is where one of the bands is attached to the back of the stone setting. When a repair is made to sterling silver, heat is involved. Usually the stone would have to be removed or your risk at the least, the stone losing its adhesion to its setting and at the worst, the stone cracking or otherwise being damaged. I would not advise camouflaging the crack with silver solder unless you are an experienced silversmith but then if you were, you wouldn’t be asking me ! But you bring up an excellent point – many Native American bracelets are damaged when people repeatedly open and close the bracelets to put them on and take them off. This can not only loosen the stones, especially with inlays, but it can also crack the silver. Read more about selection and care of sterling silver bracelets.